Fascinating and unforgettable, Pam Jenoff's THE LOST GIRLS OF PARIS is a captivating tale of friendship and courage told from the points of view of three incredible women.... 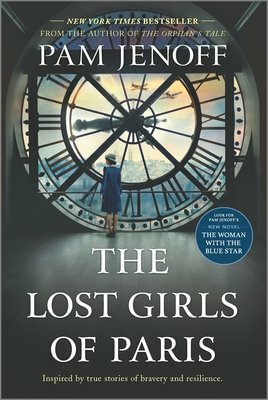 Beautifully written and expertly populated by complex, believable characters, THE LOST GIRLS OF PARIS is easily one of the best World War II novels I have ever read. Never before have I seen so much suspense paired with such heartfelt, powerful emotion --- especially without one overpowering or weakening the other. I will definitely be adding Pam Jenoff to my must-buy list of authors, and I look forward to recommending this book to many of my friends. Jenoff's most curious misstep involves a narrator named Grace, who starts the novel off when she stumbles upon a suitcase belonging to Eleanor Trigg in 1946, at Grand Central Station in New York.... Grace's inexplicable turn is not only unneeded in the novel, it also strains all credibility when she's able to piece together top-secret post-War information with the alacrity of, well, a trained spy. But for what? It's never made clear and this is where "The Lost Girls of Paris" is most disappointing: Jenoff has at her disposal a great, mostly untold story of heroism and espionage, both about the woman who trained an elite force of operatives and then spent years looking for them after their death, and also about what it was like to be one of those women, but the result has all of the tension of a Hallmark card. This is a slight re-telling of a remarkable story and an unusual slip-up from the dependable Jenoff.